The Cambodian People’s Party has done well in commune elections, giving Prime Minister Hun Sen a boost. The votes from last Sunday’s commune elections in Cambodia are still being tallied, but by all accounts Prime Minister Hun Sen and his ruling party have fared well. The Cambodian People’s Party (CPP) controlled 1,592 out of 1,633 communes going into the poll. They will at least match that, and will increase the number of seats they hold in each commune. Communes are clusters of villages – not unlike local district councils in the West – and how they vote is seen as an important indicator for general elections due 12 months from now. 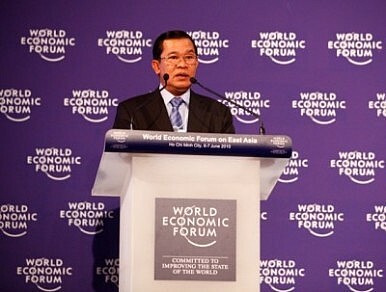 Hun Sen should be happy. He maintained overwhelming control despite a sharp drop in the participation rate to around 60 percent from more than 80 percent at previous polls. The biggest loser was the main opposition leader Sam Rainsy, who lives in self-imposed exile in France from where he has urged Cambodians to follow the Middle East experience and foment an Arab Spring type uprising. The Sam Rainsy Party (SRP) lost ground in its strongholds, like the capital where it has traditionally captured the young and upwardly mobile vote. It can count 22 communes under its control, down six, while the Human Rights Party appears to have picked up six for a total of 18. The SRP’s abysmal performance was matched by Funcinpec, the party of royals that once commanded enormous respect and popular support among the broader electorate. Funcinpec all but self-destructed, with its leader, Prince Norodom Ranariddh, convicted of corruption charges after he sold the party’s headquarters. There was an attempt to regroup and bring Ranariddh back into the fold during the lead-up to the commune elections, but it didn’t help; Funcinpec might get one commune. Despite the many problems that continue to afflict this country, Cambodia is experiencing an unprecedented period of growth. The national highway grid is almost complete, and most people have access to clean water, sewage, schools and some healthcare. The idea that Sam Rainsy – who has a good life in France – can incite a rebellion against the powers that be in Cambodia is sheer nonsense. Hun Sen knows this, and also that this poll was reasonably well received by the 15,000 national and international election monitors who followed it. Absent was the violence that has plagued previous elections and the prime minister, whether Sam Rainsy likes it or not, is well placed for next year’s general election.